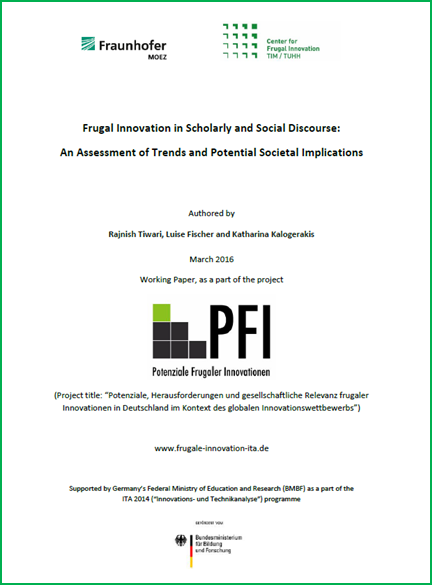 This paper has a three-fold objective: (a) It seeks to establish the theoretical antecedents of frugal innovation by examining the scholarly discourse; (b) It attempts to generate hypotheses about its long-term relevance by examining historical trends of frugality and their disappearance; (c) It seeks to comprehend the social perception of frugal innovation in the specific German context by assessing the relevant social discourse. 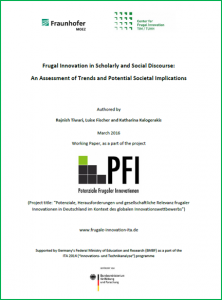 Based upon an extensive literature review and some preliminary primary data we propose a new working definition for frugal innovation and hypothesize that frugality was a key social value with positive associations before the era of unprecedented prosperity in the industrialized world, which led to saturated markets and inter alia to feature-driven competition and over-consumption of resources. New ground realities, e.g., economic downturn in the industrialized world and the rapidly rising consumption in the economically developing world, are expected to turn frugality, once again, into an important societal value and frugal innovation into a critical success factor in mid-term future. This entry was posted in English, Publications and tagged BMBF-ITA, Competitiveness, Developed Countries, Emerging Economies, Frugality, Germany, Industrialized Nations, International Business, Jugaad, Low-cost innovations, Responsible Innovation, Sustainable Growth, Thrift by Rajnish Tiwari. Bookmark the permalink.